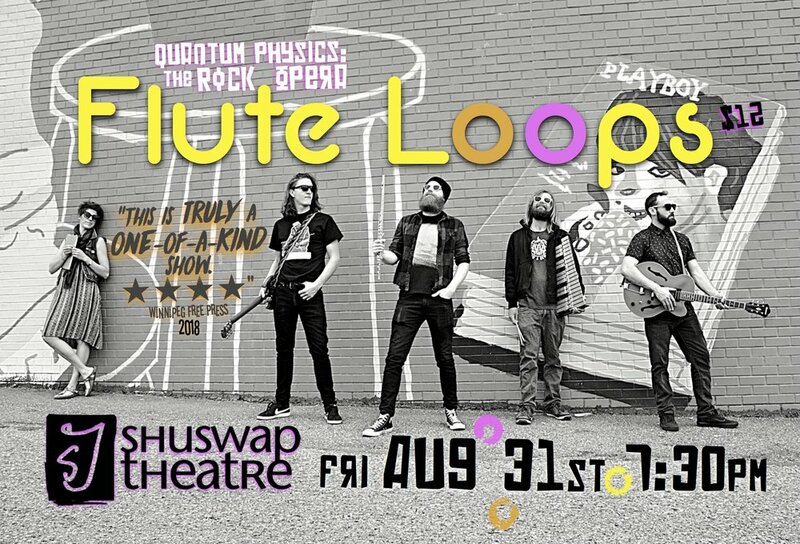 Shuswap Theatre presents Flute Loops, for ONE NIGHT ONLY in Salmon Arm: August 31! Last seen locally wowing audiences with Berlin Waltz at 2016's Theatre on the Edge festival, Devon More returns to Salmon Arm for ONE NIGHT ONLY to present her latest work of original music theatre. The Flute Loops are the latest hipster band to go viral - and they are about to take the stage..! Meanwhile, the quantum physics PhD student working the merch table is attempting to warp space-time - while under the influence (of Stephen Hawking). Quarks, quirks, and the substance of sound collide with cosmic content, comedic timing, and contagious melodies. Get to know the nitty gritty of the itty bitty, with a unique indie rock soundtrack featuring some of the most famous riffs and licks - from the classical genre..?!? Flute Loops was a CBC Critics' Pick in Winnipeg, and was named Runner Up for the Creativity Award at the Montreal Fringe. In her role, Devon More was voted Best Performer at the 2018 Hydra Festival in Kamloops.